Ranging from ...: Unlucky Reedbuck....Lucky us! The day was a dreary, misty foggy day. The expectations for any great sightings were pretty low but we decided to head out any way in search of the elusive Giraffe. We headed out to the open plains of Zen Zulu with a light drizzle slowly coating us all with a sticky moisture. From a vantage point up on the ridge I spotted a lone dagga boy buffalo along the lip of the fever tree forest, slowly making his way deeper into the vegetation. We headed out towards him and had a really good comparative sighting of the buffalo in amongst a herd of Wildebeest. These guys are often confused with each other although close up the differences are unmistakable. Just next to the buffalo, we heard a loud branch snap, and standing just next to the road, beneath a fever tree was an elephant bull. He was feeding quite calmly and never even noticed us drive up. After sitting with him for about 2 minutes, I looked to my right where the fever tree forest ends, and the open plains of Zen Zulu begin, and walking along were the two Cheetah! After absolutely no argument, we decided to follow the cheetah and see if we could get a better sighting of them. Coincidentally enough, there was a track running along the path the the cheetah were following. They slowed their pace down a bit, so I parked my vehicle and we watched them walk directly in front of us, not even 30 metres away. 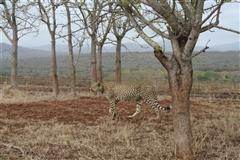 All of a sudden the lead cheetah picked up his pace and began a swift jog with the second cheetah following behind. We held our breath as he picked up speed, and an invisible reedbuck popped up from it's cosy nest in the long grass. The reedbuck had no chance of escape as the cheetah were too near and the reedbuck was too late to make a run for it. The cheetah neared the reedbuck and it flicked out its front paw knocking the reedbuck off balance and bringing it to the ground. The lead cheetah quickly clamped its jaws down on the reedbucks throat, closing of the windpipe and suffocating it. The second cheetah had caught up by that stage and was using it's body to hold the reedbuck down until it had been killed. All this was happening not even 30 metres in front of us! We were very lucky to have the sighting all to ourselves and enjoy the moment until the other vehicles appeared. The precision of the cheetahs kill and the swiftness made the whole thing very mechanical and was not as gruesome as I imagined witnessing a kill would be. It was over in a matter of minutes and the cheetah started feeding. By that stage a vehicle from Leopard Mountain and a vehicle from Bayete Zulu had joined us and we all sat in awe as we watched these amazing animals devour the reedbuck, with my guests and I still wiping away the emotional tears that were shed at watching such an incredible thing. While we wee sitting there facing the Cheetah, the lone buffalo made its way over to see what was going on. This is when my guests and I decided the day could not get any better and we moved off. On our way off the plains, we found crash of rhino comprising of 2 males, a young female calf and an older mature female who was obviously in oestrus as the males were fighting for her attention while she was trying to fight them off! We parked the vehicle and just absorbed the sights and sounds around us when it appeared that the rhino had completely forgotten we were there and decided to walk next to us in the vehicle. I read their body language and decided that they were pretty relaxed, and showing no curiosity towards us at all. I drew an imaginary line in the road and decided that if they crossed that line they would be in our comfort zone and I would then move the vehicle out of the space. These guys came up right next to us, and stood about 2 metres away smelling the air towards us and having a good look! My guests and I were dead quiet but I decided that if I were to switch on the ignition, they would get a huge fright and might charge the vehicle, so I started talking to them just to let them know we were there and they needed to move off. You can imagine me sitting there with two foreign guests who were turning blue, too scared to exhale saying "you're too close guys, you need to move off..." over and over until the rhinos curiosity was fulfilled. Apologies for such erratic posts, but with the holiday season being so busy there just wasn't time. I have saved up all our great sightings and will hopefully be posting more regularly. From all of us at Rhino River Lodge, we hope that 2011 will be a good year for everyone, including our Rhino's which are being poached at such a merciless rate. We urge you that if on one of your safaris in South Africa, if you do come across any suspicious behaviour or people, please let someone know. You could be saving a rhinos life.